Founded in 1950, our client is one of the world's largest Food & Beverage companies. Based out of Boston, US, the company has over 9000 retail stores in more than 35 countries with reported revenue of over US$828.9 Million in 2016. Their coffee & baked food chain products include bagels, donuts, and a variety of other baked goods along with various cold and hot beverages. Our Cloud-enabled Sales Analytics platform can support 36 Million data records per day collected from 9000 stores and generate intuitive reports for intelligent actions. This Business Intelligence solution helps the company to gain real-time business insights from critical data to boosts its sales and optimize labor costs. Let's discuss your Analytics initiative. Talk to our Expert, today! Food & Beverage companies are creating competitive advantage by exploiting innovative ways to utilize their data and our client is one of them. Understanding sales operations, customer behaviour and labor costs is easier, when it comes to one store. But this becomes a mammoth task with thousands of stores, varied products line, and aggressive competition. Our client had an on-premise business intelligence (BI) solution, to understand the sales process at each store. However, they were facing challenges with the solution as it took a long time to generate reports with numerous data silos. The existing system generates reports with a downtime of about 12 hours. In addition, the reports were restricted to one view of single dimension only, such as sales, labor, discount, etc. Each day, the store manager analyzes the reports to take decisions regarding product discounts, markdowns, promotions, and labour costs individually. The single dimension view of the report made it practically impossible to take quick decisions on all of them at one go. As part of the reorganization process, the client had to work towards boosting sales as well as cutting costs. Upgrading the existing BI system wasn’t the answer. The company wanted a flexible solution which can provide exclusive report on sales pattern, eliminate downtime and provide intuitive reports at multi-dimensional level for intelligent decision making. They required a high-performance Business Intelligence solution that could aggregate data, generate reports and present them for access via Web application. This is where Saviant has stepped-in as a Data Analytics consulting partner to architect the solution. Our Food Service and Analytics expertise has helped the team to architect the Business Intelligence solution that can help client to gain insights and boosts sales. Azure Cloud services such as Azure Data Factory, Azure Blob Storage, Azure SQL Database and Azure Data Lake Analytics were leveraged by our analytics consultants to build this solution. Once the store’s POS data - store name, product name, sales price, staff name, etc., is made available, the solution processes these data records, aggregates them and presents the reports. Azure Blob Storage stores the POS data files and Azure Data Factory activity consisting of U-SQL Job reads the files & processes them. The output then gets stored in the Blob, where another activity processes the data and puts it in Azure SQL Database. Here, the staggering data volumes are refreshed in near-real time, which is then made available for presentation via Power BI. Cloud-enabled Sales Analytics solution provides the sales pattern for each store and analysis with respect to each item sold. This helps the sales team to identify the favourite item that is being sold at that particular store. 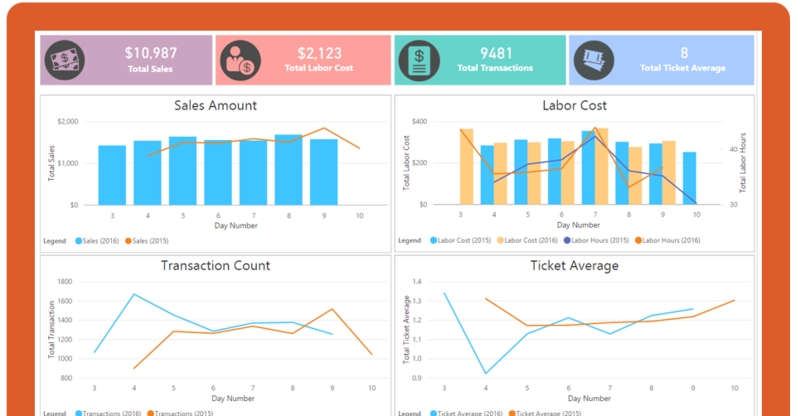 The BI solution delivered by Saviant, a Power BI partner, also provides labor cost analysis with respect to sales in order to determine the labor expense in accordance with sales per store. With Power BI tool, the sales teams can drill down analytics into hourly, weekdays, weekend, festivals, holidays, seasons by store & department. Although the new analytics platform is yet still in the PoC stage, our client is already seeing many impressive results. Preferred Data Platform & Analytics Consulting Partner. Trusted by Fortune 500. Talk to our Data Architect, today!